Xbox Live and the Achievement system kind of reinvented the high score list, letting you compete against your friends even when you're roaming solo through a stark, barren wasteland. It looks like Nissan is doing much the same with the Leaf -- but minus the bloatflies and the supermutants. As the cars are now rolling out to eager owners we're learning more about just what its Carwings system can do and another neat trick is the "Regional Rankings" page, where one driver's driving efficiency is rated against others in the area. There are bronze, silver, and gold medals up for grabs but, if you cover the thing with speed tape and only commute downhill, you might just be awarded the platinum award. What does that get you? Why, a little picture of a trophy, of course. What were you expecting? 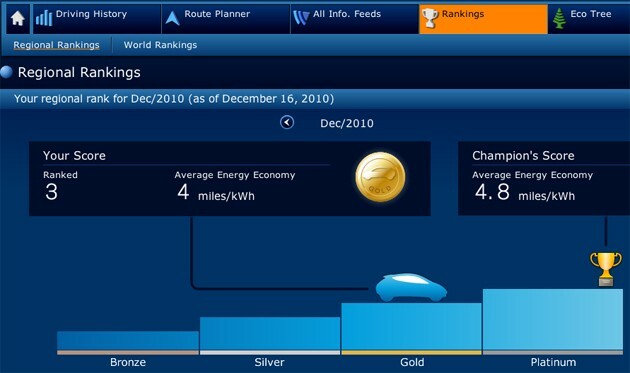 Nissan Leaf rates you against other drivers, creates a high score list for hypermilers originally appeared on Engadget on Sun, 26 Dec 2010 15:21:00 EDT. Please see our terms for use of feeds.